Much of the middle ear and all of the inner ear are inaccessible to direct examination. 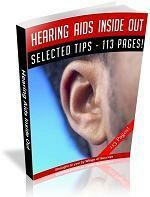 Some inferences concerning their condition can be made, however, by testing auditory function. Pathways of Hearing. Vibrations of sound pass through the air of the external ear and are transmitted through the eardrum and ossicles of the middle ear to the cochlea, a part of the inner ear. The cochlea senses and codes the vibrations, and nerve impulses are sent to the brain through the cochlear nerve. The first part of this pathway—from the external ear through the middle ear—is known as the conductive phase, and a disorder here causes conductive hearing loss. The second part of the pathway, involving the cochlea and the cochlear nerve, is called the sensorineural phase; a disorder here causes sensorineural hearing loss. 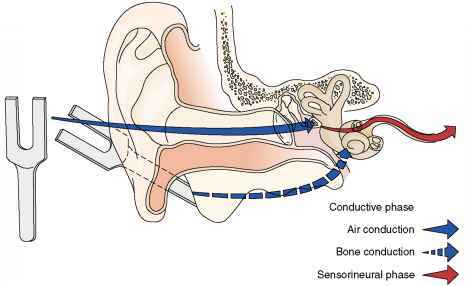 Air conduction describes the normal first phase in the hearing pathway. An alternate pathway, known as bone conduction, bypasses the external and the middle ear and is used for testing purposes. A vibrating tuning fork, placed on the head, sets the bone of the skull into vibration and stimulates the cochlea directly. In a normal person, air conduction is more sensitive. Equilibrium. The labyrinth within the inner ear senses the position and movements of the head and helps to maintain balance. 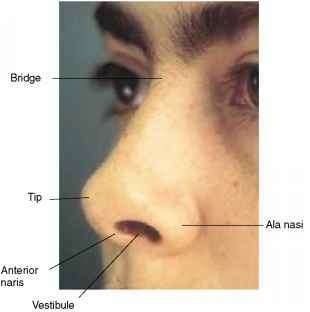 Review the terms used to describe the external anatomy of the nose. Approximately the upper third of the nose is supported by bone, the lower two thirds by cartilage. Air enters the nasal cavity by way of the anterior naris on either side, then passes into a widened area known as the vestibule and on through the narrow nasal passage to the nasopharynx. The medial wall of each nasal cavity is formed by the nasal septum which, like the external nose, is supported by both bone and cartilage. It is covered by a mucous membrane well supplied with blood. The vestibule, unlike the rest of the nasal cavity, is lined with hair-bearing skin, not mucosa. Laterally, the anatomy is more complex. Curving bony structures, the turbinates, covered by a highly vascular mucous membrane, protrude into the nasal cavity. Below each turbinate is a groove, or meatus, each named according to the turbinate above it. Into the inferior meatus drains the nasolacrimal duct; into the middle meatus drain most of the paranasal sinuses. Their openings are not usually visible. The additional surface area provided by the turbinates and the mucosa covering them aids the nasal cavities in their principal functions: cleansing, humidification, and temperature control of inspired air. Inspection of the nasal cavity through the anterior naris is usually limited to the vestibule, the anterior portion of the septum, and the lower and middle turbinates. Examination with a nasopharyngeal mirror is required for detection of posterior abnormalities. This technique is beyond the scope of this book. The paranasal sinuses are air-filled cavities within the bones of the skull. Like the nasal cavities into which they drain, they are lined with mucous membrane. Their locations are diagrammed below. 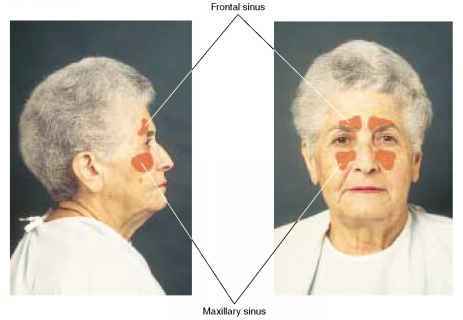 Only the frontal and maxillary sinuses are readily accessible to clinical examination. The lips are muscular folds that surround the entrance to the mouth. When opened, the gums (gingiva) and teeth are visible. Note the scalloped shape of the gingival margins and the pointed interdental papillae. The gingiva is firmly attached to the teeth and to the maxilla or mandible in which they are seated. In lighter-skinned people, the gingiva is pale or coral pink and lightly stippled. In darker-skinned people, it maybe diffusely or partly brown as shown below. A midline mucosal fold, called a labial frenulum, connects each lip with the gingiva. A shallow gingival sulcus between the gum's thin margin and each tooth is not readily visible (but is probed and measured by dentists). Adjacent to the gingiva is the alveolar mucosa, which merges with the labial mucosa of the lip. 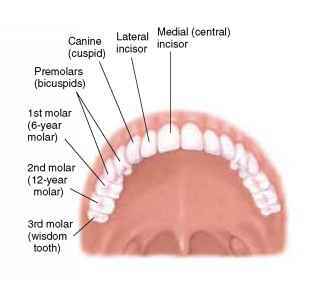 Each tooth, composed mostly of dentin, lies rooted in a bony socket with only its enamel-covered crown exposed. 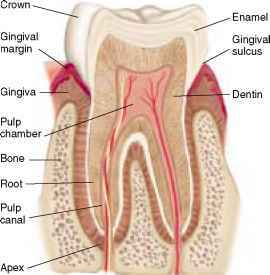 Small blood vessels and nerves enter the tooth through its apex and pass into the pulp canal and pulp chamber. The 32 adult teeth (16 in each jaw) are identified below. lar gland (Wharton's ducts) pass forward and medially. 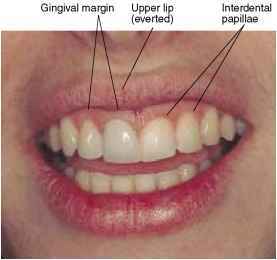 They open on papillae that lie on each side of the lingual frenulum. Each parotid duct (Stensen's duct) empties into the mouth near the upper 2nd molar, where its location is frequently marked by a small papilla. The buccal mucosa lines the cheeks. Above and behind the tongue rises an arch formed by the anterior and posterior pillars, soft palate, and uvula. In the following example, the right tonsil can be seen in its fossa (cavity) between the anterior and posterior pillars. In adults, tonsils are often small or absent, as exemplified on the left side here. A meshwork of small blood vessels may web the soft palate. Between the soft palate and tongue the pharynx is visible. Manubrium of the sternum nomastoid to the trapezius and is bounded below by the clavicle. A portion of the omohyoid muscle crosses the lower portion of the posterior triangle and can be mistaken by the uninitiated for a lymph node or mass. 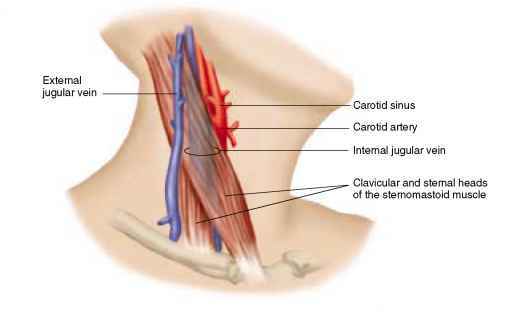 Deep to the sternomastoids run the great vessels of the neck: the carotid artery and internal jugular vein. 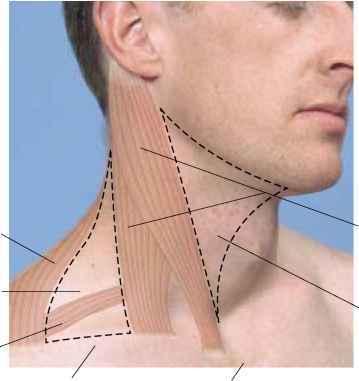 The external jugular vein passes diagonally over the surface of the sternomastoid. below the cricoid. The lateral lobes of this gland curve posteriorly around the sides of the trachea and the esophagus. 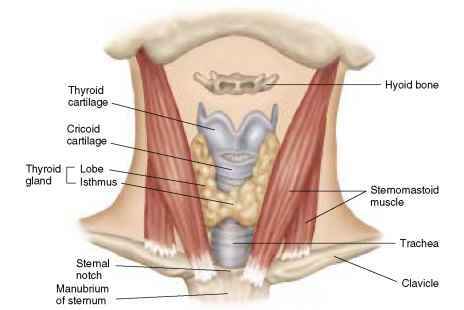 Except in the midline, the thyroid gland is covered by thin straplike muscles, among which only the ster-nomastoids are visible. Women have larger and more easily palpable glands than men. 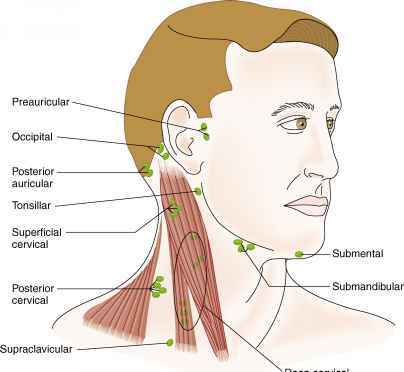 The lymph nodes of the head and neck have been classified in a variety of ways. 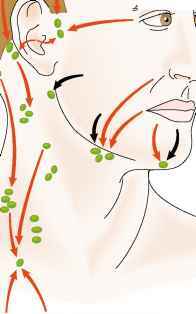 One classification is shown here, together with the directions of lymphatic drainage. The deep cervical chain is largely obscured by the overlying sternomastoid muscle, but at its two extremes the tonsillar node and supraclavicular nodes may be palpable. The submandibular nodes lie superficial to the submandibular gland, from which they should be differentiated. Nodes are normally round or ovoid, smooth, and smaller than the gland. The gland is larger and has a lobulated, slightly irregular surface (see p. 115). Note that the tonsillar, submandibular, and submental nodes drain portions of the mouth and throat as well as the face. Knowledge of the lymphatic system is important to a sound clinical habit: whenever a malignant or inflammatory lesion is observed, look for involvement of the regional lymph nodes that drain it; whenever a node is enlarged or tender, look for a source such as infection in the area that it drains. Tonsils, which are also composed of lymphoid tissue, become gradually smaller after the age of 5 years. In adulthood, they become inconspicuous or invisible. The frequency of palpable cervical nodes gradually diminishes with age, and according to one study falls below 50% sometime between the ages of 50 and 60. In contrast to the lymph nodes, the submandibular glands become easier to feel in older people. The eyes, ears, and mouth bear the brunt of old age. Visual acuity remains fairly constant between the ages of 20 and 50 and then diminishes, gradually until about age 70 and then more rapidly. Nevertheless, most elderly people retain good to adequate vision—20/20 to 20/70 as measured by standard charts. 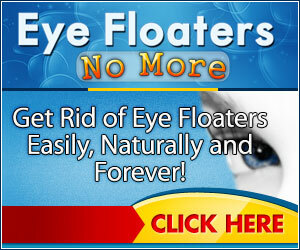 Near vision, however, begins to blur noticeably for virtually everyone. From childhood on, the lens gradually loses its elasticity and the eye grows progressively less able to focus on nearby objects. This loss of accommodative power, called presbyopia, usually becomes noticeable in one's 40s. Aging also affects the tissues in and around the eyes. In some elderly people the fat that surrounds and cushions the eye within the bony orbit atrophies, allowing the eyeball to recede somewhat in the orbit. The skin of the eyelids becomes wrinkled, occasionally hanging in loose folds. Fat may push the fascia of the eyelids forward, creating soft bulges, especially in the lower lids and the inner third of the upper ones (p. 175). Combinations of a weakened levator palpebrae, relaxation of the skin, and increased weight of the upper eyelid may cause a senile ptosis (drooping). More important, the lower lid may fall outward away from the eyeball or turn inward onto it, resulting in ectropion and entropion, respectively (p. 177). Because their eyes produce fewer lacrimal secretions, aging patients may complain of dryness of the eyes. Corneal arcus (arcus senilis) is common in elderly persons and in them has no clinical significance (p. 180). The corneas lose some of their luster. The pupils become smaller—a characteristic that makes it more difficult to examine the fundi of elderly people. The pupils may also become slightly irregular but should continue to respond to light and near effort. Except for possible impairment in upward gaze, extraocular movements should remain intact. Lenses thicken and yellow with age, impairing the passage of light to the retinas, and elderly people need more light to read and do fine work. When the lens of an elderly person is examined with a flashlight it frequently looks gray, as if it were opaque, when in fact it permits good visual acuity and looks clear on ophthalmoscopic examination. Do not depend on your flashlight alone, therefore, to make a diagnosis of cataract—a true opacity of the lens (p. 180). Cataracts do become relatively common, however, affecting 1 out of 10 people in their 60s and 1 out of 3 in their 80s. Because the lens continues to grow over the years, it may push the iris forward, narrowing the angle between iris and cornea and increasing the risk of narrow-angle glaucoma (p. 148). Ophthalmoscopic examination reveals fundi that have lost their youthful shine and light reflections. The arteries look narrowed, paler, straighter, and less brilliant (p. 190). Drusen (colloid bodies) may be seen (p. 187). On a more anterior plane you may be able to see some vitreous floaters—degenerative changes that may cause annoying specks or webs in the field of vision. You may also find evidence of other, more serious, conditions that occur more often in elderly people than in younger ones: macular degeneration, glaucoma, retinal hemorrhages, or possibly retinal detachment. Acuity of hearing, like that of vision, usually diminishes with age. Early losses, which start in young adulthood, involve primarily the high-pitched sounds beyond the range of human speech and have relatively little functional significance. Gradually, however, loss extends to sounds in the middle and lower ranges. When a person fails to catch the upper tones of words while hearing the lower ones, words sound distorted and are difficult to understand, especially in noisy environments. Hearing loss associated with aging, known as presbycusis, becomes increasingly evident, usually after the age of 50. Diminished salivary secretions and a decreased sense of taste have been attributed to aging, but medications or various diseases probably account for most of these changes. Teeth may wear down or become abraded over time, or they may be lost to dental caries or other conditions (pp. 203-205). Periodontal disease is the chief cause of tooth loss in most adults (p. 203). If a person has no teeth, the lower portion of the face looks small and sunken, with accentuated "purse-string" wrinkles radiating out from the mouth. 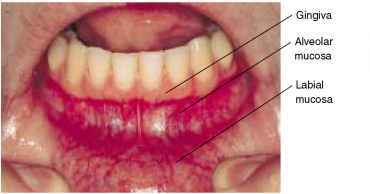 Overclosure of the mouth may lead to maceration of the skin at the corners—angular cheilitis (p. 198). The bony ridges of the jaws that once surrounded the tooth sockets are gradually resorbed, especially in the lower jaw. What is a sunken eardrum? How to find parotid duct? Which structures lay deep and superior to the clavicle? What is stensens ducts and whartons duct? How to make lips smaller nerves? Why is the gland behind my ear swollen? 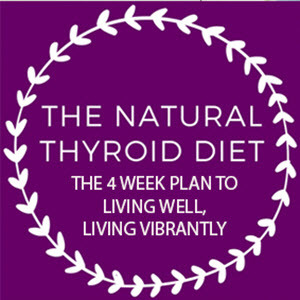 What do enlarged cervical lymph nodes look like? How do throat look blood vessel? Which doctor for treatment for lymph nodes? What are Wharton and Stensen's ducts? 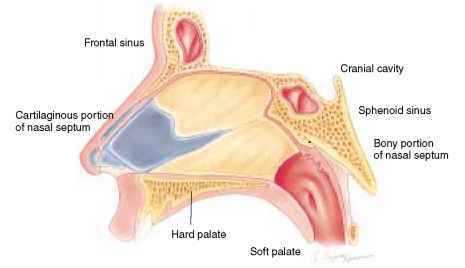 Which of the paranasal sinuses are accessible to clinical examination?